Co-produced with Sound and Music and supported by Arts Council England, Mopomoso’s first ever UK tour took place between 23rd and 30th of April 2013. Each night of the tour was unique as local musicians from each city joined the line-up. With a firm focus on free improvisation, musical references ranged from jazz, rock, folk, classical, electronic, world and computer-generated music, representing the broad brush stroke spirit of inclusion embodied in the Mopomoso aesthetic. Kay Grant started in the downtown New York scene but crossed the Atlantic, while clarinetist Alex Ward started improvising with Derek Bailey. Both are now longstanding and vital members of the London scene, having played with a veritable Who?s Who of the world’s improvisers, and bring their mutual experience in multiple musical styles to the table. Furious, humorous and sonorous all at once, it’s a dynamic duo that has been evolving for over five years. Their CD ‘Fast Talk …Being a Collection of Live Musical Conversations Recorded on Several Auspicious Occasions’ (Emanem) has received rave reviews and was listed in The Wire’s 2012 Rewind Jazz and Improv top chart. 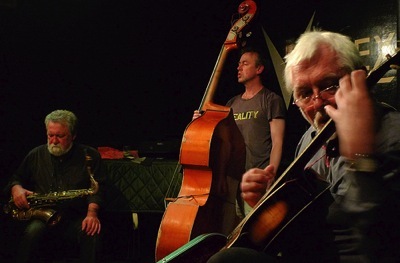 All established artists in the experimental new music scene and members of the London Improvisers Orchestra, Alison Blunt, Benedict Taylor and David Leahy have played together in various combinations for many years and as a trio since 2010. Sharing a passion for string orientated improvising they initiated an explorative ensemble in 2012 with Chicago based artist Renee Baker. Called ‘Burning Wood’, a compilation of recordings ranging from trio to sextet configurations will be released later this year. Also this year they begin several higher education projects in institutions including Goldsmiths, University of London and the Royal College of Music where they will give seminar/workshops and work with composition students to explore improvised music and the relationship between improvisation and composition. Pat Thomas studied classical piano from the age of 8 and started playing Jazz from the age of 16. He has since gone on to develop an utterly unique style – embracing improvisation, jazz and new music. He has played with Derek Bailey in Company Week (1990/91), AND (with Bailey and percussionist Steve Noble), The Tony Oxley Quartet, The Celebration Orchestra and in Duo with Lol Coxhill as well as numerous other collaborations both in the UK and abroad. A world class saxophonist and innovator Evan Parker has been, and continues to be, a highly regarded and pivotal figure in the world of free improvisation. ‘House Full of Floors’ sees him in the company of two equally skilled players, guitarist Russell and bassist Edwards, playing a fast moving, constantly evolving music full of surprises. A trio that has been described as ‘knotty, subtle and deeply intuitive’ and ‘engaging, vital and dynamic’, Evan himself has said that playing in the group is ‘like three people on a tight rope each holding a safety net for the others’. For over thirty years Keith Tippett has been at the forefront of contemporary European jazz and new music – as a pianist, composer, bandleader, band member and musical educator. 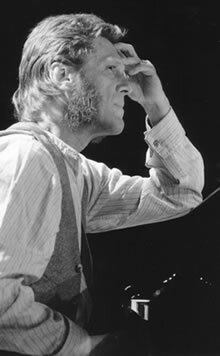 Tippett’s work ranges from his unique free improvisation as a solo pianist and with duos and small groups such as the quartet Mujician, to compositions for – and performances with – contemporary classical groups (including the Composers’ Ensemble, Kokoro and the Kreutzer and Elysian String Quartets). Keith continues to perform in many ensembles as well as solo and in duo with Julie Tippetts throughout the World.